Your Family, Agile, and You: On our way (Burn) up! - Part#1: It does not mean the burn down chart makes us go down. On our way (Burn) up! - Part#1: It does not mean the burn down chart makes us go down. A burn up chart (not to be confused with the burn down chart) is a true motivator for getting things done. It enables us to see our progress, it provides quick feedback that allows decision making, and you can quickly see if your decisions were efficient and effective. Behind the burn up chart lies a process, of course, and our performance is reflected in the chart. Using the burn up chart with Agile enables one person, or a team with a common goal, to continuously improve over things that needs to be done. 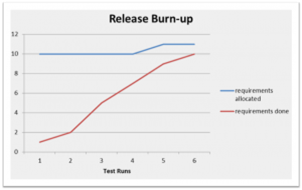 Burn up charts are widely used in software development Scrum teams to reflect the release status as compared to the changed release scope. But the truth is that it is an awesome tool for personal improvement. So what IS a burn up chart? 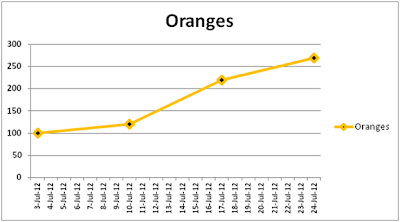 A burn up chart is a graphical representation that tracks progress over time by accumulating functionality as it is completed. The accumulated functionality can be compared to a goal, such as a budget or release plan to provide the team and others with feedback. The Y axis: Represents the accumulated functionality completed over that period of time (stories, value or cost). For example: For an orange factory, we ship orange crates. Every week, we add the amount accumulated to the chart at this week point in time. Now obviously, behind the ‘shipped orange crate’ item there is a process that needs to be followed. 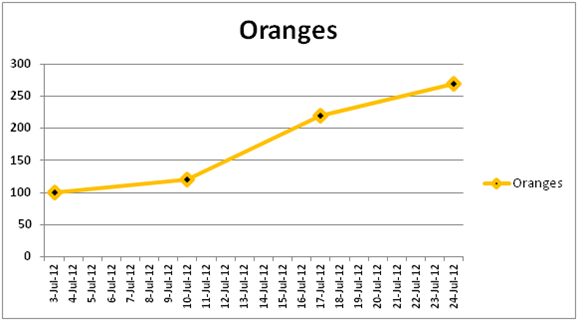 Pick the oranges → Sort → Clean → Pack → Transport to the warehouse → load the trucks Ship → Reach destination. The way the factory performs this process effectively and efficiently will be reflected in the chart final outcome points. The chart is just a reflection of a process performance. 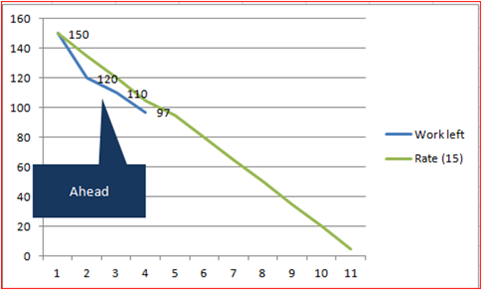 So what’s the difference between a burn DOWN chart and a burn UP chart? When we do have a fixed amount of tasks that need doing in a specific time frame, a good way to motivate the team can be to follow the amount of work left. Visualizing the progress from one day to another as a team has a good impact toward achieving the goal. It provides feedback, and earl feedback at that! Seeing your team’s progress means that it’s far more likely that the tasks will be carried out. We can deal with any impediments that may occur early on, and make decisions that will change our work flow as we approach our goal. We know where we stand at each and every step, we know how fast we are progressing, and the changes we need to do to complete it. For example: a teacher has committed to finish grading 20 exams by the end of the week. Counting down the work left is a good motivator; it’s like a countdown toward the spaceship or a missile launch. When our goal is one of completion, even within a specified time frame, and we want to track the progress and the amount of work we can do, we may want to use a burn up chart. For example - converting leads into opportunities as compared to the monthly goal for the sales department. In this case, turning a lead into an opportunity is a long process involving many hands and operations. Visualizing the amount of contracts signed is a huge motivator for a team to keep driving towards the goal. Knowing the rate of change enables us to use the early feedback coming from the chart to take action and project the lines forward in time. So both burn up and a burn down charts encourage teams to get things done. ● We can use each of them on the same project. Each reflecting a different scope or process and each is valuable for encouraging continues improvement. ● They are both visibility tools – and as we know, visibility is a powerful tool in getting things done. ● They both reflect reality as it changes. Reality = the process of work we set to get from point A to point Z. ● They are both dynamic enough to reflect a decision or process change immediately. For example : Yesterday we had a rank of 50. Due to market changes, we made a small change - and that is immediately reflected. Early feedback enables us to review our decisions. ● All of the above acts as good motivators towards success – our ability to see and control the flow of events play a curtail rule here in getting things done.